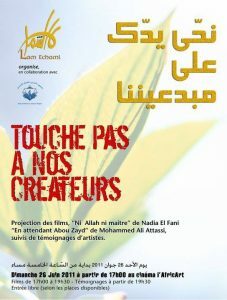 Film screening of “Ni Allah, ni maître” by Nadia El Fani, “En attendant Abou Zayd” by Mohamed Ali Attassi, followed by testimonies from artists who had experienced assaults. 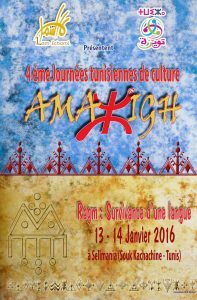 Since 2013 and every year since, Lam Echaml celebrates the Amazight new year by organizing cultural activities in partnership with Amazighs associations and particulary “Twiza” association. 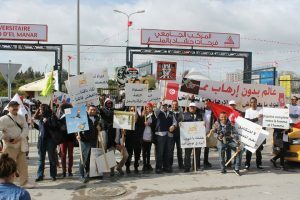 Each year, on the anniversary of the tunisian revolution of the 14th of January, Lam Echaml participates to the different public demonstrations that take place. 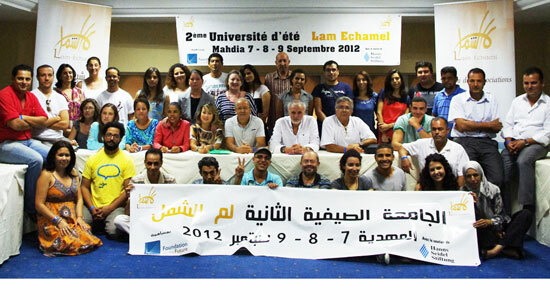 Lam Echaml participated to the “Forum Social Mondial” in 2013 and 2015. Meetings are organized every last Saturday of the month, with the aim of initiating debates, preferably contraversial, about democratic transition and the multiple issues it raises, either for justice, education, media, women, or local and regional developement. 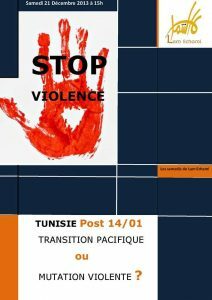 2nd meeting: Tunisia after 14/01- peaceful transition or brutal change? 3rd meeting: 26 January 78 and afterwards: testimonies and readings. 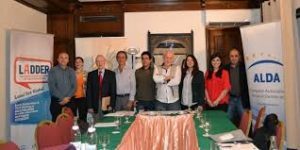 Organization of an international colloquium on : “Transitional Justice, Human rights and reconciliation” in partnership with YIHR CRO (Youth Initiative for HumanRights – Croatia). 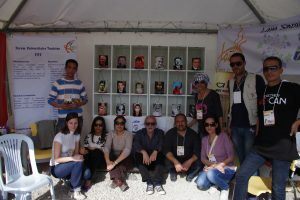 Date: 12 to 15 June 2015- Location: Ibn Khaldoun Hotel in Tunis. 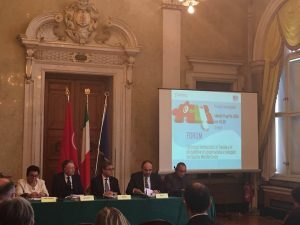 Organization of an international meeting on: “Perspectives on decentralization, local democracy and development” as part of “Vox-in-Box” and “AGENS 3D” projects. 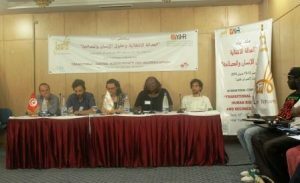 Organization of an international meeting to discuss the : ” Mediterranean Charter for democracy and local autonomy” – CHARMEDAL, with the participation of the LADDER project members, the ALDA association (Association of Local DemocracyAgencies), actors of the tunisian civil society as well as political parties. 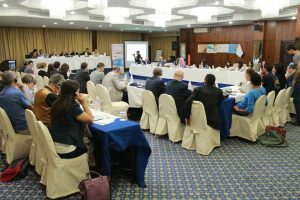 Date: 29 April 2016 – Location: DIPLOMAT hotel, Tunis. 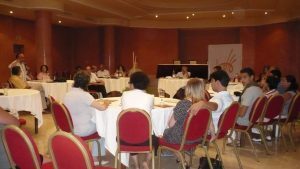 Project goals : Train members of civil society organizations and local authorities to get them involved in the good practices of local governance, in order to strengthen the dialogue between them. 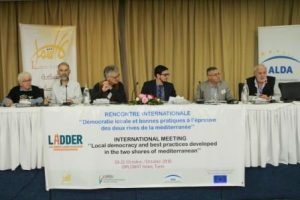 A workshop to elaborate and ratify a “National “National charter for local and participative democracy” took place, as part of the LADDER project. 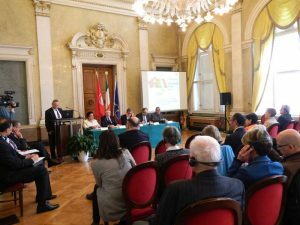 Organization of a visit to Trieste in 9 April, together with Lam Echaml, the Quatuor and the region of Friuli Venezia, in order to pay tribute to the role played by civil society, as well as the Quatuor, for the success of the democratic process in Tunisia. 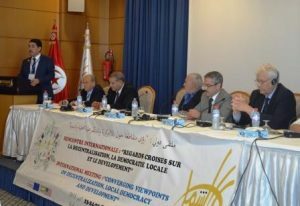 During these days, members of the 24 regional clubs of Lam Echaml meet with the members of the executive board to program the next activities. 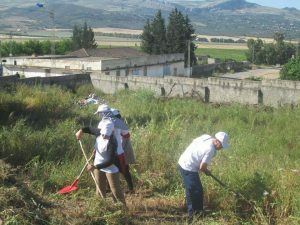 “Warm Winter” in Thibar, Beja, in partnership with the Red Crescent in Tunis & LTR Youth Club, 10 January 2016. 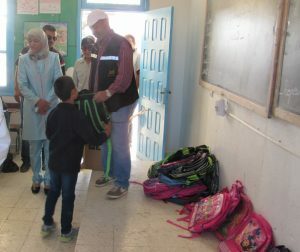 ” Action: “Solidarity- Back to school 2017/2018” For children in need, from the primary schools of Zaghouan, Kebili, Beja, Gabes, Bizerte and Sidi Bouzid, after a Lam Echaml’s call for donations. 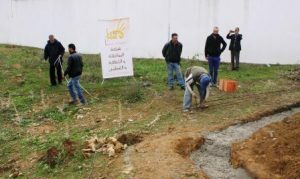 Participation in the workshop “Participation guide in the municipal action”, in Bizerte. Participation in the workshop on the municipal elections, at Jughurta hotel in Gafsa, from 19 to 22 October 2017. Signature of a partnership between Lam Echaml Gabes, the municipality of Gabes and CHAHED observatory, for undertaking different activities related to raising awarness among youth and women, as well as to strengthen links between the municipality and the civil society, as part of a role model of a local governance experience. Raising awarness of municipal affairs in weekly souks (/markets), festivals and public spaces. 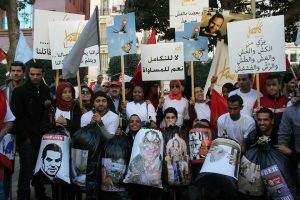 A concert of the singer Yasser Jradi also took place as part of the campaign promoting citizens to register for municipal elections, August, 2017, in Gabes. 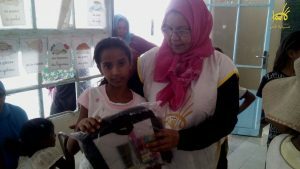 Participation to a training program around violence against women, with the support of CREDIF, in Gaves. April and May 2017.